The Brinkmann 5-Burner Propane Gas is a classic style grill with 896 square inches of total cooking area, which makes it ideal for grilling for a large group of persons. Its LED illumination control panel offers low-cost energy for after-dark grilling. The fact that this grill comes assembled is a big plus, as you will not have to bother with anything else but the grilling itself. And it’s also very easy to connect a propane tank to it. 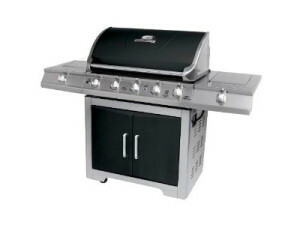 But the main advantage you get with this grill is that it has an enormous amount of space for grilling. You can definitely handle big reunions with it and can cook in an efficient manner. You can easily fit burgers or steaks for 12 on the bottom shelf, while a top shelf handles veggies, buns, or whatever else you want to make. If you still need extra space for cooking, the full size burner to the right can easily handle a big pot of boiling water for corn, lobster or steamers. You will soon begin to notice that this grill has poor quality materials. The metal is very thin and has a cheap aspect. The Brinkmann OEM cover will form surface rust in no more than a couple of months, and it will be very difficult to clean it. And you might want to shelter it from any rain storm, as it will definitely ruin it. You shouldn’t expect this grill to last for more than a year of moderate use. If you are in need of a grill for an unexpected event where you expect many people to show up, you can definitely count on the Brinkmann 5-Burner Propane Gas. It will get you through that particular hot spot with no problems. But you really shouldn’t consider it to be a long-term solution for your grilling needs. Its cheap materials are not going to last more than a year, so you may want to consider purchasing a more professional tool.